England feels crowded compared to the NW US, even compared to New York. People brush against you as you pass them on the pavements, the tube staircases, mounting and dismounting the trains. The tube stations are warm and muggy laced with the stench of sweat, and its only April. Sidewalk person-to-person collision avoidance weaving is required, not optional. Here in Leicester square, Alfred Gilbert’s statue of Eros has his own space above the crowds on the originally much maligned Shafetsbury memorial fountain from where he threatens passers-by with a dose of love, intended as a representation of christian charity. This scribble was published on Friday, May 8th, 2009. You can follow any banter on this scribble with the RSS 2.0 feed. You can share your inspired musings after typing the anti spam word near the bottom of the page. But no Pinging because its too naughty. awwww I wish I had gotten today’s anti-spam word yesterday….it’s STOPCOCK haha. 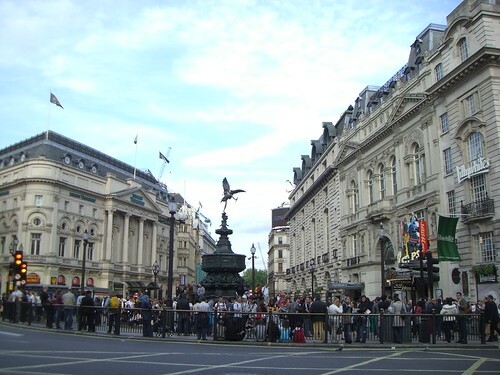 I loved this blog entry, I used to work in Leicester Square and pass eros daily – great memories. Rob’s right, I thought exactly the same thing when seeing this picture – it does look like one of those passers by is in his line of sight(seeing). I try to avoid Leicester Square at the best of times and Trafalgar Square is even worse. I wonder how many people notice the statue of Eros as they bustle pass. I admire your ability to get the photo. I can’t escape quick enough to take a picture. Up until the sixties I’m told this used to be where to pick up down-at-heel actresses working as street-walkers and eros was a warning about the risks of stds. Christian charity or christian morality perhaps? All this changed with the era of free love, but it’s before my time so can offer no confirmation.